Neil Young loves his cars. He proved as much when he unveiled LincVolt, his eco-friendly car company, and then turned the concept into an album, 2009's Fork in the Road. Unfortunately for Young, his vintage cars, along with other memorabilia, were caught up in a warehouse fire in San Carlos, CA. According to an ABC report, the Bay Area warehouse contained paintings and at least six cars, along with other items. Worse still, the 15,000-square-foot space housed musical equipment in road cases, plus canisters of archival film footage and music. Firefighters responded quickly to the blaze, which took about an hour to put out. The majority of the items inside were saved, although at least one vintage car was lost. There's no word as to whether the film footage and music was saved, but according to San Carlos fire marshall Jim Palisi, Young "had a lot of film material in there that the firefighters protected." No one was injured in the fire and police do not suspect foul play. The damages were reportedly around $1 million. 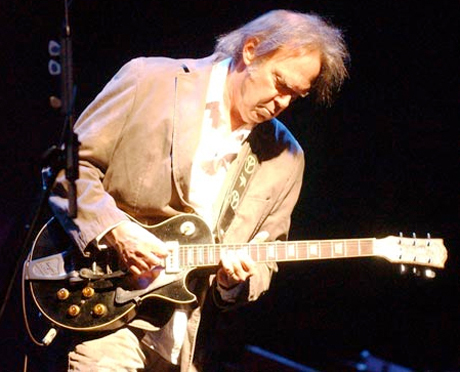 Of course, if archival Neil Young material was damaged, the losses could be priceless.